Colour was the theme for the 2018 Widnes Group Chairman’s Charity Ball and a most colourful event it proved to be! It was attended by over 100 brethren, family, friends and guests who were all resplendent in dazzling attire! Pictured from left to right, are: Liz Pedder, Claire Liptrott and Neil Pedder. Following a drinks reception in the bar, the guests moved to the Alan Locke Suite and took their seats at their tables which were beautifully decorated in keeping with the theme of the evening. Group chairman Neil Pedder then welcomed everyone to the 4th Annual Charity Ball and expressed his delight at the number of people in attendance. Neil explained that in this country, Freemasons are one of the largest supporters of national and local non-Masonic charities and in 2017 the West Lancashire Freemasons’ Charity donated over £50,000 to organisations in Lancashire. To clarify any confusion as to why Widnes Freemasons donate to West Lancashire, Neil explained that as far as Freemasons are concerned, Widnes never left Lancashire! Neil went on to say that several years ago the Widnes Group decided to focus their attention each year on a local charity and was happy to announce that the chosen charity for this year would be St Luke’s Scout and Guide Group and the Moon Meadow project, ‘Raise the Roof’. Neil then extended a personal welcome to the representatives from St Luke’s and hoped that they enjoyed the evening ahead of them. Pictured left: Mark Pedder (right) proposes the toast to the ladies. Pictured right: Liz Pedder responds to the toast to the ladies. Before handing over to Bob Williams who was the director of ceremonies for the evening, Neil thanked John Gibbon for his hard work in helping to prepare for the evening and as a token of appreciation Neil and his wife Liz, presented John’s wife Yvonne with a bouquet of flowers. Neil then took the opportunity to thank Bob Williams and Steve McNee for ensuring that the evening would run smoothly. Neil also expressed thanks to the hall caterers Pat, Billy (better known as Sugar and Spice) and their staff together with Sandra and her bar staff in making sure the evening would be a great success. Neil then wished everyone a very enjoyable evening and asked Bob Williams to get the evening under way! Bob then introduced Claire Liptrott of the Moon Meadow Project who delivered an insight into just what they were trying to achieve. Claire explained that Moon Meadow is home to St Luke’s Guiding and Scouting groups and with nearly 200 children coming through the doors every week, the building is a massive part of our community, and that it would be a great disappointment if it was not around for future generations to use. Claire pointed out that the whole roof needs removing and replacing and once the roof is replaced, the heating and ventilation system will also need fully replacing. This project will be ongoing for some time and is not a simple, over-night job. All money raised will go towards the roof funds which includes survey fees for structural engineers and maintenance of the facilities until the renovations can begin. Pictured left: Marie and Frank Parle having a great time. Pictured right: Norma Black and her daughter-in-law Suzanne Black with their prizes. She went on to say that it means a great deal to our local community as not only is Moon Meadow used for Scouting and Guiding purposes, it has hosted numerous outside events, such as band nights, charity events, birthday parties, dance classes and training sessions and on behalf of all the children, volunteers and the local community who use these facilities, she thanked the group chairman for his support of the project. Following a most enjoyable meal Mark Pedder, the senior warden of Hale Lodge of Fellowship No 3799 addressed the guests and explained that this year, as our group chairman is also the WM of Hale Lodge of Fellowship, a decision was made to incorporate certain elements of their Ladies Evening into the Charity Ball. 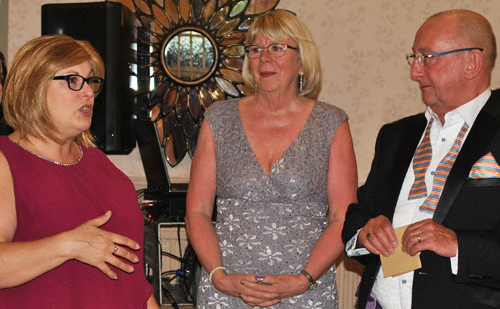 Claire Liptrott (left) thanking Neil and the group for the generous donation. Mark went on to say that it was his honour and privilege to propose the traditional toast to the ladies and before raising our glasses to them he wished our ladies good health and happiness and asked that the ladies accept our heartfelt appreciation for their understanding and support of our Masonic endeavours. The entertainment for the evening was provided by The Sensations, who are regular visitors to Widnes Masonic Hall and were once again fabulous. In between eating, drinking and dancing there were tried and trusted games like Stand-Up Bingo and Roll-A-Pound and too many raffle prizes to mention! As the evening ended, Neil Pedder thanked everyone for their support and for making the evening a huge success with the final amount raised for this year’s chosen charity being an amazing £4,000! Time to relax and have fun. Article and pictures by Andy Pope.